My mother in-law just bought a Phillips Noodle Maker few weeks ago and we have been experimenting and making different types of homemade noodles. 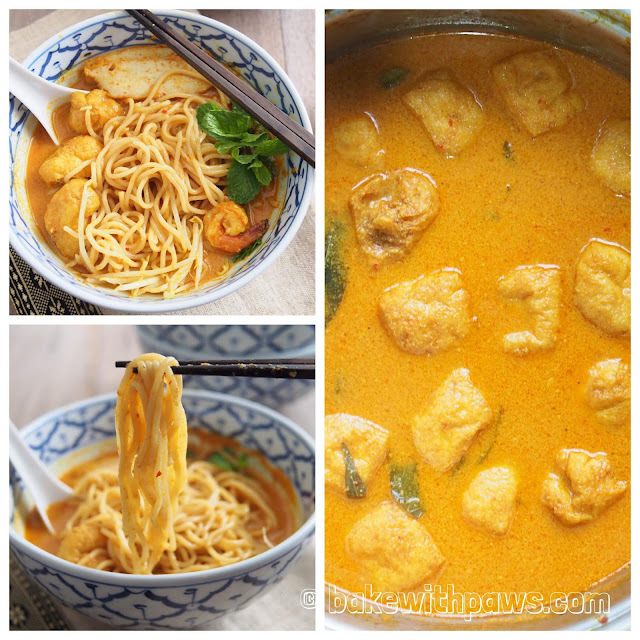 I cooked this curry soup for the homemade noodles. 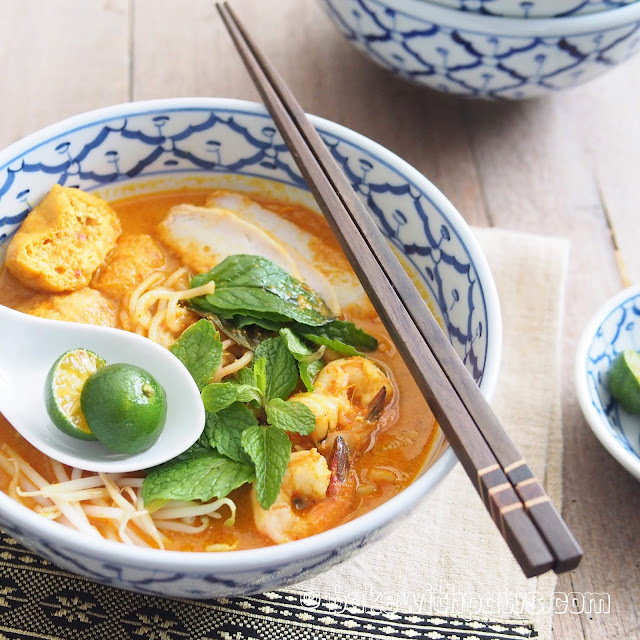 I particularly like this curry noodle soup as it is combination of Malaysian and Thai styles. I have not yet shared noodle recipe here as I am still fine tuning the recipe for the noodle maker. You may click here for my homemade noodle recipe I shared sometimes ago if you like to make your own noodles. Prawn & Chicken Stock - Remove prawn shell and keep the prawn meat aside. In a wok, heat up 2 tbsp of cooking and fry all the prawn shell until aromatic or turn to golden orange. In a medium pot add water, fried prawn shell, chicken wings ad chicken back. Bring to boil then turn the heat down and simmer for almost 1 - 1 1/2 hour. Strain the stock through a fine sieve and keep aside. In a big pot, heat cooking oil and fry the spice paste and cardamom till aromatic or fragrant. Next add the chicken and prawn stock. Bring the gravy to boil then add in coconut milk. Lower the heat and let the gravy simmer for few minutes, then add kaffir lime leave and continue simmer. Blanch the prawns in boiling gravy for approximately 1 minutes or until cooked through. Remove the prawn and keep aside. Next add in the tofu puffs. Add the seasoning to the desired of flavour. Place a serving of noodles in a bowl. Ladle boiling curry gravy over the noodles and top with a little of each of the topping ingredients. Serve with fish sauce and squeeze the calamansi lime if you want a little sourness.